Our paper titled “Silver iodide formation in methyl ammonium lead iodide perovskite solar cells with silver top electrodes” has been ranked as #1 most cited paper among all the papers that have been published by Adv. Mater. Interfaces (Link). Prof. Yabing Qi is among the world top 100 authors on the research topic of perovskite solar cell according to the record count in Web of Science (data retrieved on October 6, 2018). Our paper titled “Silver iodide formation in methyl ammonium lead iodide perovskite solar cells with silver top electrodes” has been selected as Hot Paper (Top 0.1%) according to Web of Science (data retrieved on November 14, 2017). Prof. Qi received Young Scientist Award (Bronze Prize) from Materials Research Society of Japan. Our paper titled “Accelerated degradation of methylammonium lead iodide perovskites induced by exposure to iodine vapour” has been selected as Hot Paper (Top 0.1%) according to Web of Science (data retrieved on September 25, 2017). 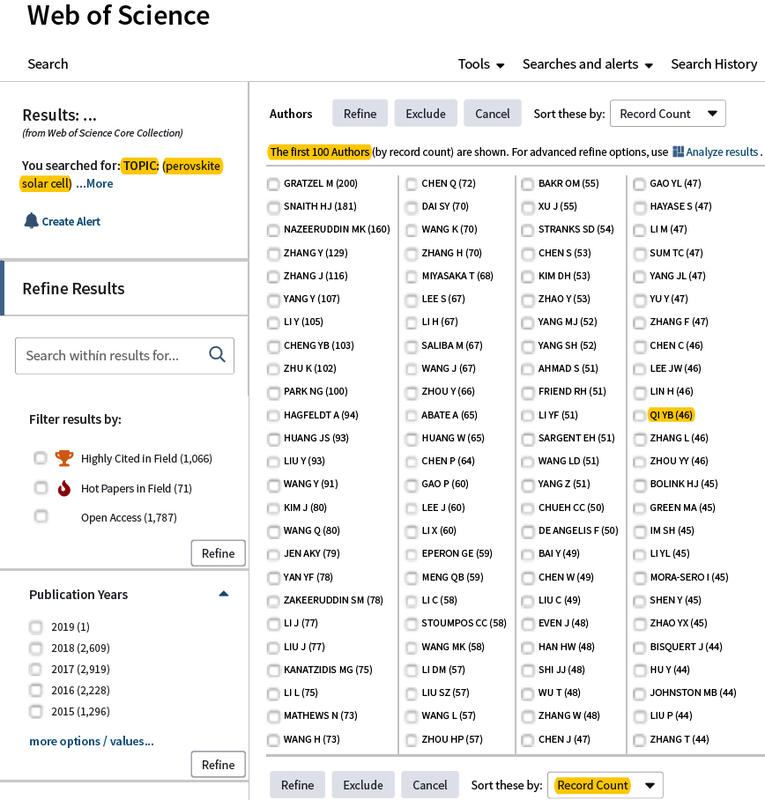 9 papers from Prof. Yabing Qi's research unit are ranked as Top 1% Highly Cited Papers according to Web of Science (data retrieved on February 1, 2017). Prof. Yabing Qi is among the world top 100 authors on the research topic of perovskite solar cell according to the record count in Web of Science (data retrieved on February 1, 2017). Our paper titled “Silver Iodide Formation in Methyl Ammonium Lead Iodide Perovskite Solar Cells with Silver Top Electrodes” published in Advanced Materials Interfaces ranks #8 on the “Most Accessed 01/2016 to 12/2016” list. Our new article titled "Accelerated degradation of methylammonium lead iodide perovskites induced by exposure to iodine vapour" has been highlighted in the "News and Views" section of Nature Energy. Our new article titled "Accelerated degradation of methylammonium lead iodide perovskites induced by exposure to iodine vapour" published in Nature Energy ranks #2 according to the Altmetric score. Altmetric calculates a score based on the online attention an article receives. Our new article titled "Transamidation of dimethylformamide during alkylammonium lead triiodide film formation for perovskite solar cells" has been selected for inclusion in the special issue of Early Career Scholars in Materials Science in Journal of Materials Research. Our new paper titled “Moisture and Oxygen Enhance Conductivity of LiTFSI-Doped Spiro-MeOTAD Hole Transport Layer in Perovskite Solar Cells” published in Advanced Materials Interfaces ranks #5 on the “Most Accessed 06/2016” list. 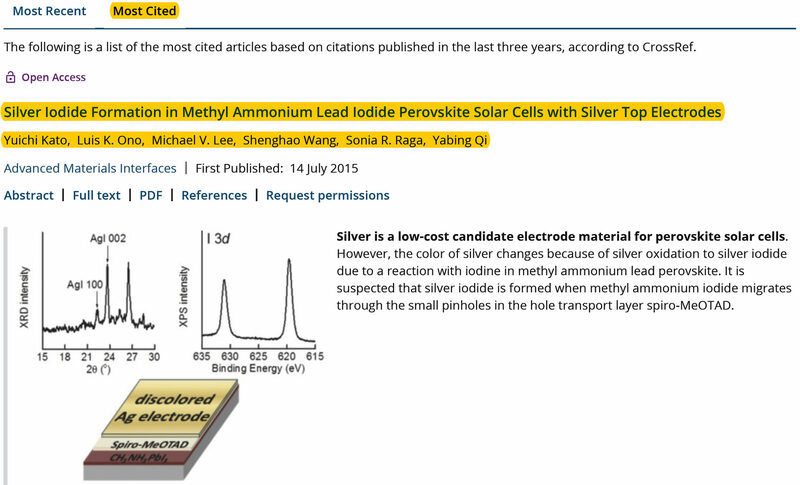 Also, our paper titled “Silver Iodide Formation in Methyl Ammonium Lead Iodide Perovskite Solar Cells with Silver Top Electrodes” published in Advanced Materials Interfaces ranks #6 on the “Most Accessed 07/2015 to 06/2016” list. Ryukyu Shimpo newspaper published an article to introduce our Unit and perovskite solar cell research. While board shaped solar cells, with shiny dark silicon bases, are being widely used, currently, thin, bendable, transparent solar cells are under fierce research and development competition in the world. Silicon based solar cells are costly due to their complex manufacturing processes under high temperature and high pressure. On top of that, installing a thick heavy silicon based solar panel needs a firm foundation, which results in limited candidate location and additional costs. Meanwhile, the OIST Energy Materials and Surface Sciences Unit headed by Prof. Yabing Qi has been using crystal perovskite composed of organic and non-organic materials. The solar cell has five layers with a light-absorbing perovskite layer is sandwiched by metal electrodes, where the sun light is converted to electricity. The thickness of this solar cell is only 135 nanometers, only one thousandth of a conventional silicon solar cell. As the required amount of material is much less, it is less costly and the energy conversion efficiency has reached 20%, the same level as silicon solar cells. Currently, OIST has been researching on how to manufacture this perovskite solar cell in even more costless way with application of some printing technology. The base material is a thin film of pet bottle material. On this layer, the Unit's newly developed solar cell material is applied with an ultra sound sprayer. "The principle is the same as the ink jet printer," says Dr. Mikas Remeika, a postdoctoral scholar in this Unit. In addition, required machines for manufacturing this solar cell is only one to two meters in size, and it will need only a single day to make one solar panel in the OIST laboratory. The only one issue the perovskite solar cell faced was its speed of depletion. OIST Ph.D student Zafer Hawash identified countless pinholes on the layer of spiro-MeOTAD that degraded the perovskite and silver electrodes causing reduced efficiency. Yet, the Unit has already developed the technology to prevent such pinholes. "By improving the material after finding the pinholes, we can prolong the lifespan of the solar cell as much as ten folds," commented the Unit group leader, Dr. Katsuya Ono. "We still need to advance our research on various important factors, but the progress is fast. Once we can apply this technology in practical use, varieties of things will become possible." Development of sustainable energy is an important global issue, which will also lead to an economic development. In order to be environmentally friendly, we not only need to use renewable energy, but also need to utilize natural resources in smart ways. Perovskite solar cells we are currently developing use materials that are easily available and almost costless. If the price of the solar cells go down, consumers can swiftly recoup their spending on the solar cell through saving electricity fees. Since there is no need to utilize a large scale facility for manufacturing this type of solar cells, local towns can easily introduce them. Okinawa is especially appropriate in scale for establishing this kind of technology preparing for coming commercial production. Okinawa also has the strong sun light and has sufficient energy to run solar cells even in winter time, though, we always conduct our daily experiments using the indoor lights. Professor Qi leads an international research unit of 14 members. Originally from China himself, the team members have come from ten different countries including Brazil, Bulgaria, America and Spain, showing a perfect illustration of the high internationality of OIST. With different cultural and educational backgrounds, the team members have close communication through lunch and weekly meetings where all of the unit members get together. Prof. Qi is proud of his team. "We help each other and work together" he says. The members bring expertise from two areas of surface sciences and energy materials. A huge scanning tunneling microscope in the surface science lab allows the members to understand how individual molecules and atoms are arranged. It can even identify incorporation of a foreign molecule. The findings are used by the energy material team to develop an energy efficient cell with less impurities. "Innovative ideas are brought from people with diverse backgrounds, including different nationalities and expertise. We even worked with a research unit studying ants to understand biological evolution through examining a microscopic structure of the body surface." said Prof. Qi, emphasizing the significance of diversity. Recently published a review paper by Luis K. Ono, Matthew R. Leyden, Shenghao Wang and Yabing Qi on Organometal Halide Perovskite Thin Films and Solar Cells by Vapor Deposition. Kazakhstan's national broadcaster recently aired a TV report "New Silicon Valley will be Created in Japan" to introduce OIST, which included an interview with Prof. Yabing Qi. The article by Dr. Sonia Raga, Dr. Min-Cherl Jung, Dr. Michael V. Lee, Dr. Matthew R. Leyden, Dr. Yuichi Kato, and Prof. Yabing Qi is currently number 8 in the most downloaded articles. Dr. Sonia Raga, Dr. Min-Cherl Jung, Dr. Michael V. Lee, Dr. Matthew R. Leyden, Dr. Yuichi Kato, and Prof. Yabing Qi's recently published article is currently number 8 in the most downloaded articles in Chemistry of Materials in the last 30 days. The article titled "Influence of Air Annealing on High Efficiency Planar Structure Perovskite Solar Cells" was published on the 3rd of February 2015. Media coverage for Hawash, Z. et al article “Air-Exposure Induced Dopant Redistribution and Energy Level Shifts in Spin-Coated Spiro-MeOTAD Films"
New article by Mr. Zafer Hawash, Dr. Luis Ono, Dr. Sonia Raga, Dr. Michael Lee and Prof. Yabing Qi has been published online in Chemistry of Materials; "Air-Exposure Induced Dopant Re-distirbution and Energy Level Shifts in Spin Coated Spiro-MeOTAD Films"
Dr. Shenghao Wang and Dr. Luis Ono 's recently published article is currently number 7 in the most downloaded articles from RSC Publishing in the last 30 days. The article titled "Fabrication of Semi-Transparent Perovskite Films with Centimeter-scale Superior Uniformity by the Hybrid Deposition Method" was published on the 5th of September 2014 in the journal, Energy & Environmental Science. Most Downloaded Articles in Energy Env. Sci. New article "Temperature-dependent hysteresis effects on perovskite-based solar cells" was accepted today by Journal of Materials Chemistry A.
Time- and temperature-dependent photocurrent transient analysis suggests that hysteresis effects are associated with multiple charging-discharging processes in a perovskite solar cell. Dr. Leyden's recently published article is currently number 2 in the most downloaded articles from RSC Publishing in the last 30 days. The article titled "High Performance Perovskite Solar Cells by Hybrid Chemical Vapor Deposition" was published on the 5th of September 2014 in the Journal of Materials Chemistry A. New article "High Performance Perovskite Solar Cells by Hybrid Chemical Vapor Deposition" was accepted today by Journal of Materials Chemistry A. The journal publishes work of international significance on all aspects of materials chemistry related to energy and sustainability. New article by Dr. Shenghao Wang and Dr. Luis Ono was published online today in Energy and Environmental Science "Fabrication of Semi-Transparent Perovskite Films with Centimeter-scale Superior Uniformity by the Hybrid Deposition Method"
New fellows join our lab members, Dr. Mikas Remeika as postdoctoral researcher, and OIST rotation student Mr. Lin Li. New postdoctoral research fellow joined the group this week, August 20th, 2014, Dr. Robin Ohmann. Dr. Kato's recently published article is currently number 6 in the most downloaded articles from ScienceDirect in the last 90 days. The article titled "Electrical and optical properties of transparent flexible electrodes: effect of UV ozone and oxygen plasma treatments" was published on the 17th of January 2014 in organic electronics Journal. "New Student joins the lab". Simon (Peter) Mekhail from May 2014. "New Findings to Help Extend High Efficiency Solar Cells’ Lifetime". The media section of OIST introduce our recent research. New students join now! Mr. Zafer Hawash and Ms. Yaqiong Li from January 2014. "Behind the curtain". The media section of OIST introduce the clean room, the research by the Quantum Dynamics Unit, and our research lifes.